Muhammad Ali was and is possibly still today the most famous and recognizable person on the planet Earth. Even if you lived in a mud hut somewhere, you knew Ali. I vividly remember when he walked to his seat at the Forum because the entire 18,400 guests and VIPs at this event stood up and applauded his arrival. It was truly a moving experience. I stood nearby for as long as I could to get this shot. It was not easy with all the security guards around, but by now I was a seasoned pro dealing with publicists and security guards. Nothing was going to stop me from getting this photo! 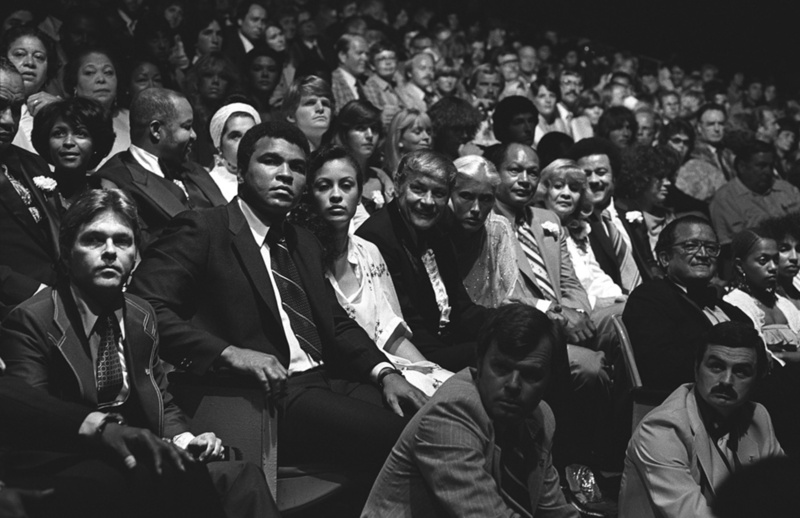 Seated next to Ali are his wife Veronica, Dr. Jerry Buss, his lovely date, the former Mayor of Los Angeles, the great Tom Bradley and his wife Ethel. Many years later, Jerry Buss invited me to a boxing match at the Forum. Seated near me at ringside was Ali, now much older and ill. I shook his hand and, for the first time in my life, asked for an autograph.